Renting these or other hides for more than a day, some discounts will be made. Check the OFFERS page. Places available: 5 (4 at the ground level and one at the upper level) in morning or afternoon sessions or full-day. As wild animals, is not guaranteed the vultures appear flying or resting in front of the hides, although the probabilities are very high. If any bird comes, the customer will can repeat the session free on a next available day (at his convenience) or pay a less amount for expenses (40 Euros). If vultures don't come but other animals like eagles, kites, magpies and ravens do it, the reduced price by person will be 70 €. Paying the whole rate, will can do a new atempt in other available day without extra charges. The hides are in an area where carrion are left in order to give an extra food for the Black and Egyptian vultures and Kites. Here, Griffons and Ravens come to eat as well. Sometimes, Golden eagles or Spanish imperial eagles land; and also may come Azure-winged magpies. 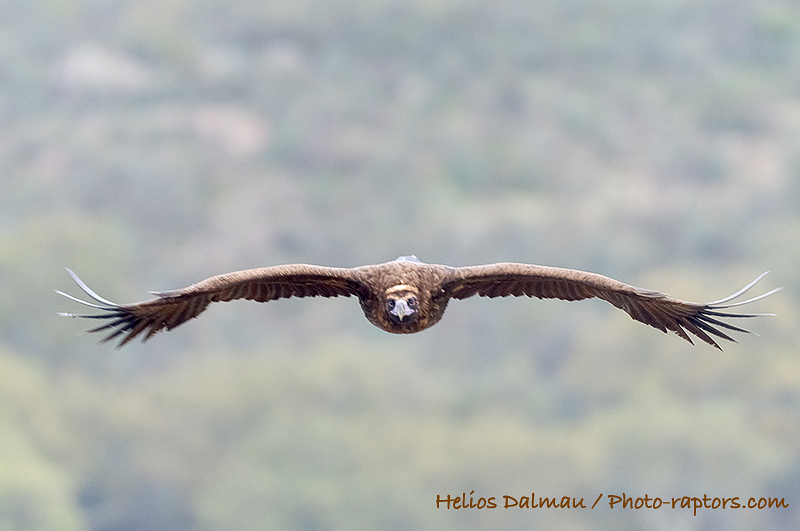 Spring and Summer: Black vulture, griffon vulture, Egyptian vulture, black kite, raven. Fall and Winter: Black vulture, griffon vulture, red kite, raven. 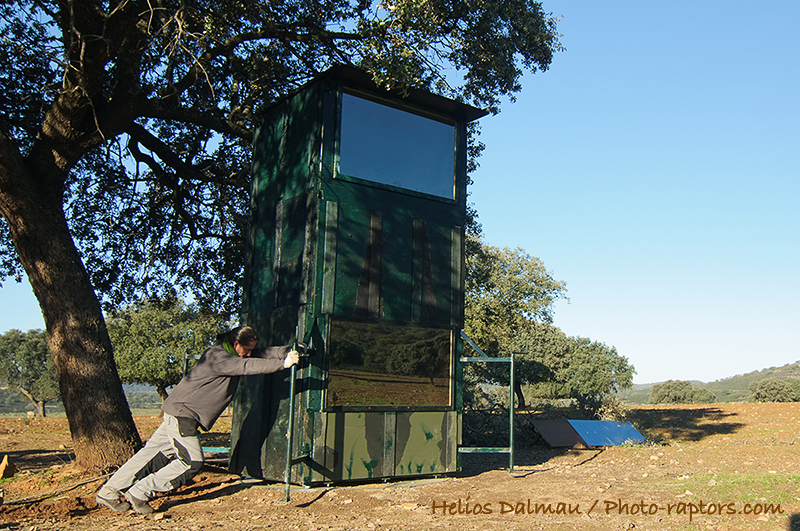 The first hide has 2,10 x 1,20 x 1,45 meters inside sizes. The second hide is divided in two highs. Inside has a 1,58 meters wide and it can receive two photographers in each floor. In both levels, the pictures are taken though panoramic reflective glasses (130x70 cm. on the lower level and 130x80 cm. on the upper level). On the first floor the camera can be placed between 60 and 120 cm. over the ground. On the second level, 1,5 meters high, the camera can be positioned between 2,30 m. and 3,10 m. over the ground because the customers can sit down or stay stand up to work. From the upper floor is possible to get the best birds flying views. The two levels hide can be turned, before the photographers are inside, and point it depend on the light direction in each year's season. The sessions can be, more or less long, half a day or complete day, depending on the year season and the number of the light hours. Photo-raptors has all the licenses required to do this activity. 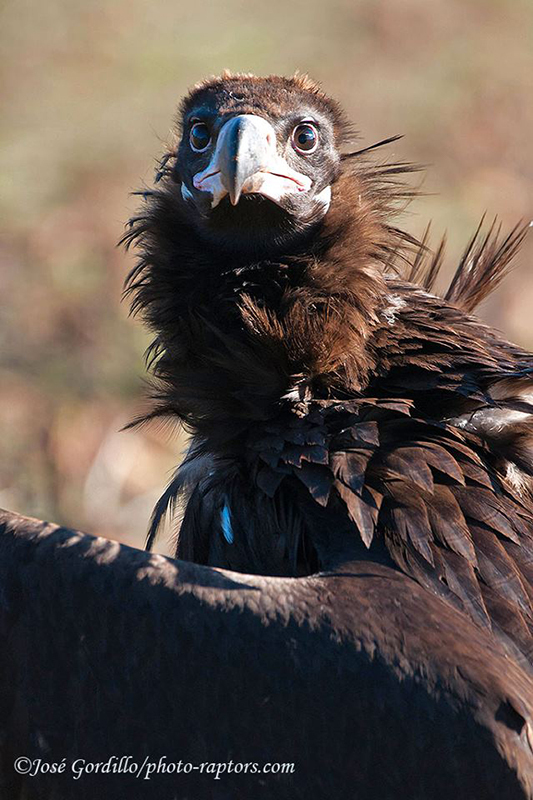 The most striking thing from this bird is surely his smashing wing scale, specially at close quarters: measure close to three meters in case of the adult vultures. Therefore, is one of the greater birds of Europe. Its global distribution is wide, from Mongolia and China to Turkey, and some isolated and small populations in Greece and France. But there are 1.600 breeding couples in Spain, most of them in the Southwest, a dozen in the Balearic Islands and, recently, very few in the eastern Pyrenees. The Sierra de San Pedro have the largest colony, with more than 310 nesting pairs, that use the cork oaks to locate their breeding large platforms and prospect the nearby meadows looking for carrion to feed, almost their exclusive diet. We use his scavenger condition to photograph at short distance from our hides through a reflective glass wide window.